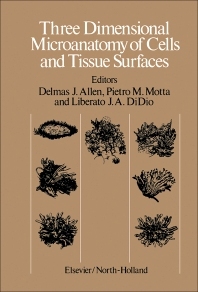 Three Dimensional Microanatomy of Cells and Tissue Surfaces focuses on the use of scanning electron microscopy in the study of the microanatomy of cells and tissues, cell relationships, and complex biological relationships. The selection first elaborates on the technical aspects of stereoprojection for electron microscopy; three-dimensional microanatomy of intracellular structures; microcirculation studies by the injection-replica method with special reference to portal circulations; and three-dimensional architecture of the mammalian liver. Discussions focus on the preparation of vascular casts, portal circulations of various organs, scanning electron microscopy, copying and printing stereopair negatives, stereoprojection, and high voltage electron microscopy. The text then takes a look at scanning electron microscope bloodvessel casts analysis, three dimensional microanatomy of reticular tissues, kidney glomerular epithelium in response to different physiological states and experimental conditions, and mammalian renal papilla and pelvis. The manuscript examines the lung in scanning electron microscopy and stereopresentation, surface topography of endocardial endothelium, scanning electron microscopy of endothelium, human vas deferens, and seminal vesicles, and dynamic morphology of the apical membrane of lactating cells viewed by freeze-fracture. The selection is a valuable reference for researchers interested in the use of scanning electron microscopy in the study of the microanatomy of cells and tissues and biological relationships.